This is just a quick post to remind you all that GABF tickets are on sale and going fast. The Friday night and Saturday member's only sessions are already sold out. You can still get tickets for the Thursday and Saturday night sessions - but hurry because those will soon be gone too! You can get more information at http://www.greatamericanbeerfestival.com/. BTW, I will be attending on Thursday evening. Also, I will be leaving for Europe next Thursday. Joycelyn and I will be visiting France (Alsace region), Germany, Austria and Switzerland. I'll try to get some posts in during my vacation. The day after I return I go straight to the Wynkoop for a tapping ceremony for the Pro-Am German Dunkles lager that we brewed last June. If you are in the area, please come by for the tapping - Tuesday, September 22nd at 5 pm MT. 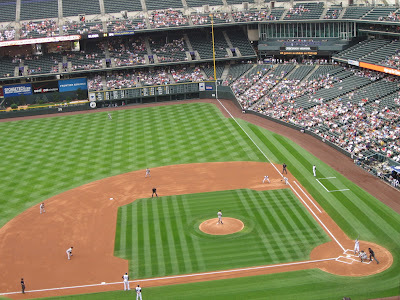 In years past when I ask people if they want to go to a Rockies ballgame it was not uncommon for me to hear, “their not doing well, and I don’t like the management, so I don’t want to go to the game.” I always reply to such statements with, “baseball is not a sport, it is a pastime. It isn’t about the team or the game as much as it is about getting out to the park, with the grass, the field, the evergreens beyond centerfield, and about having a beer in such a beautiful setting." One thing I love about Coors Field is that it has a brewery in the stadium. 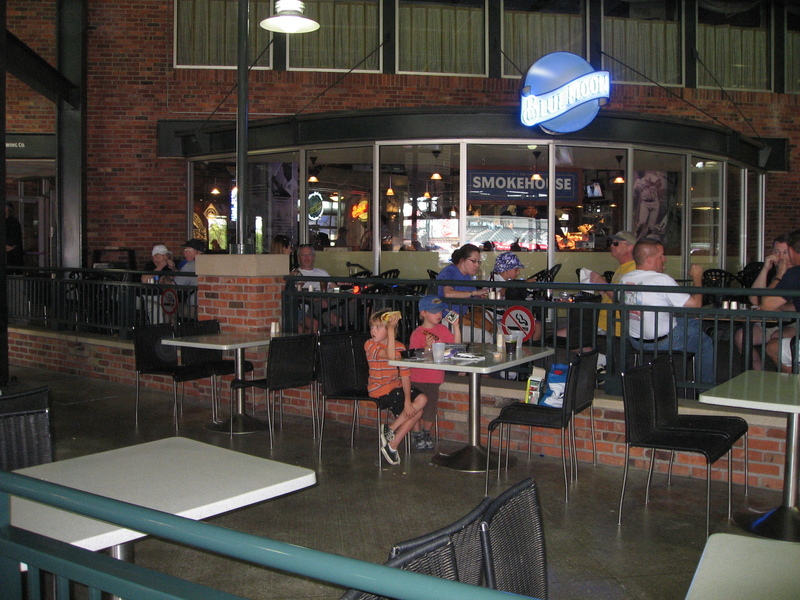 If you get a chance to go to a home Rockies game, head out to the right field area of the main concourse level and you’ll find the Blue Moon Brewing Company. This brewery used to be called the Sandlot, but Coors, who owns the brewery, decided to change the name a couple of years ago. (Though you can still see a “Sandlot” sign inside the brewery.) It is my understanding that Coors uses this brewery to pilot new beers for the Blue Moon brand. Think what you want about Coors, but the team at the Sandlot can brew. I find all of their beers to be excellent, and their Hefeweizen is the best Weißbier I’ve had on this side of the Atlantic. I love big clove flavored, phenolic Hefeweizens like Munich’s Franziskaner, and most American wheat beers, though good, lean more to the banana ester side of the flavor spectrum. The Sandlot’s offering is a terrific example of a big, clovey Hefeweizen. It is my favorite in the States, but it can be hard to find. They don’t carry it regularly, and when I was in last Thursday, the bartender said they have been out of it for the past two weeks. So it can be hit or miss. A couple of years ago they even had a Weizenbock that was basically a scaled up version of the original. It was a strong, yet pale, example with a huge, complex Weißbier aroma and flavor. The Sandlot used to call their Hefeweizen “Wild Pitch Wheat,” though I think that moniker was dropped long ago. So now you have to ask for their “banana and clove flavor German style wheat beer” to avoid being served a Blue Moon Belgian White with an orange slice in it. If you’re lucky, they’ll have their Hefeweizen gem on tap when you visit. I do have a few knocks about the brewery. At times it doesn’t seem like their heart is really into craft beer. They seldom advertise or promote their beer, and the only way to get one is if you have a ticket to the game. The brewery has always been closed in the winter, but in the mid 90’s when Coors Field opened, people could go to the Sandlot and eat & drink when the Rockies were out of town. Now the front door is bolted shut, and the only entrance is from inside the park. In addition, some of the bartenders don’t seem to know much about their own beers, nor do they seem to take in interest in their specialties when you have questions or want to talk. They are busy making mixed drinks and passing out Coors products to the people inside that are not taking advantage of fresh beer brewed on premise. But I try to put these issues aside, and take it for what it is – one of the best breweries in the city in one of the best ballparks in the country. When I was there on Thursday they had four craft beers on tap – their flagship Belgian White, a Stout, a Red Ale, and a delicious German Dunkles. I stuck to the crisp and malty Dunkles during the hot afternoon game. It was truly a delight to walk around the beautiful park and take in the sights and sounds while drinking a beer that was brewed right there in the stadium. 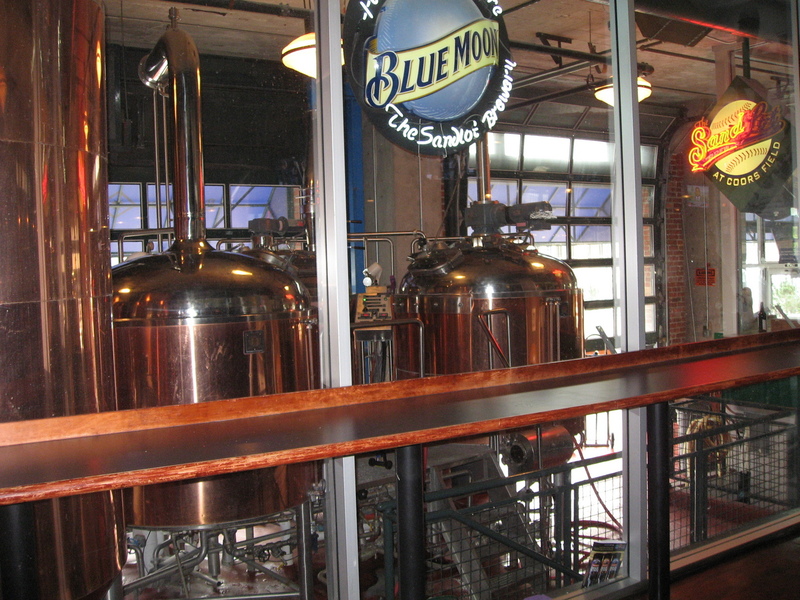 If you ever get a chance to visit Denver in the summer, make sure and take in a Rockies game and visit the Sandlot – now called the Blue Moon Brewing Company. And by the way, the Rockies beat the Pirates 10-1, but that isn’t what the afternoon was about.